Chalet Alistelle is a beautiful traditional catered chalet in Tignes Les Brevieres. Winter 2018/19 is our 14th winter welcoming guests to Chalet Alistelle many of whom return year after year. The chalet was built by local craftsman using a clever combination of stone, timber and glass. Inside it has genuine traditional alpine feel. Wood flooring throughout is softened with big rugs. The large open plan chalet living areas are warm and welcoming, full of light and space. 3 sets of French windows lead onto the south facing balcony with stunning views over the village, lake and mountains. The roaring log fire and comfy sofas create a wonderful atmosphere, perfect for social aperitifs and relaxed evenings. Chalet Alistelle is run by our professional chalet host couple, along with owners Jamie and Gayle. Together we look after all aspects of your holiday by providing a warm welcome and delicious food. We are dedicated to making your holiday superb, nothing is too much trouble. Chalet Alistelle is a fabulous chalet set in a stunning location in the charming village of Tignes Les Brevieres, nestled high in the French Alps. 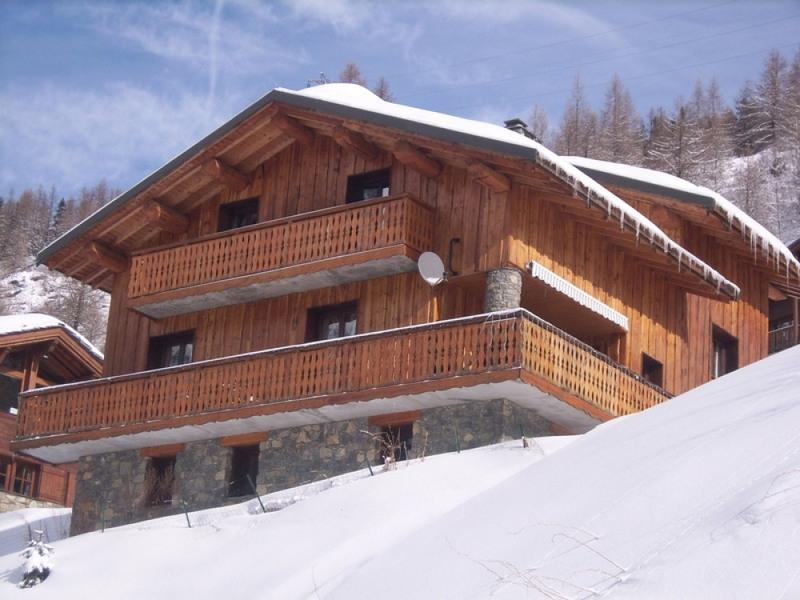 The chalet is just 100 metres from the nearest ski lift to the slopes. The resort of Tignes is made up of five villages that form part of the superb L'Espace Killy Ski area which boasts 300 km of piste and the same again off piste! Located in the trees at an altitude of 1550 metres, Tignes Les Brevieres is well linked with all the other resorts, including neighbouring Val D'Isere, by the fast modern lift network of the world class Espace Killy. The chalet has 5 beautiful bedrooms and can sleep up to 15 guests. All beds are made up with fresh white sheets, duvets and pillows. Soft white towels are provided. The chalet has 4 bathrooms; guests have the option of soaking their aching limbs in the huge jacuzzi corner bath or being invigorated in a powerful shower. The ski and boot room has heated boot dryers/warmers. We appreciate that in addition to great company and buzzing conversation sometimes we all like to chill out and be entertained. With this in mind, we have equipped the chalet with free WIFI internet, a TV, DVD player, Playstation and a stereo system with iPod dock. Set off from the lounge is a cosy snug, great for curling up with a good book. 1. Pricing column #1 shows the catered price per person per week based on booking individual bedrooms at Chalet Alistelle. 2. Pricing column #2: The total catered price for the chalet for up to 12 guests. 3. Pricing column #3: The catered price per person per week, based on the chalet being booked by 12 guests. Chalet Alistelle can sleep up to 15 guests and if you have a group of more than 12 guests, the catered price per person will be less than shown - please contact us for a tailored quote. For certain weeks we can offer up to 4 free places.